Renowned watercolorist Carolyn Grossé Gawarecki is proud of the mark she has left on others. Her dream of pursuing art began in high school, when a teacher noticed her talent. Ms. Grossé Gawarecki was excited by the idea, so she earned a Bachelor of Arts in education from Douglass College of Rutgers University and completed graduate coursework at the University of Colorado and at the University of California, Berkeley. This propelled her to her first professional positions, teacher at Highland Park High School and first woman exhibits artist for the Smithsonian Museum of Natural History. Ms. Grossé Gawarecki’s work earned her much acclaim, so much so that she decided to step out on her own as an independent watercolor workshops leader and teacher in the U.S., Mexico, and Europe in 1980. She stepped down from the position in 2009. One of the highlights of Ms. Grossé Gawarecki’s career was giving lessons in watercolor media at the Falls Church Virginia City Recreation Department from 1963 to 2011. The classes were limited to 20 people, so students lined up at four in the morning to assure their spot. Ms. Grossé Gawarecki was also proud of being elected into the National Watercolor Society, which is a very difficult feat, and of receiving the Douglass Society Award for Outstanding Achievements in 2010. One of her students had a lot to do with her earning that award, which really meant a lot. Some of Ms. Grossé Gawarecki’s other notable achievements include being represented in the permanent collections of the Ella Carouthers Dunnigan Museum, the University of Virginia Emily Couric Clinical Cancer Center, Georgetown University, the Industrial College of the Armed Forces, J.M. Smucker, and the City of Dinan, France, and contributing to professional publications. Her paintings appeared in “Best of Watercolor” in 1995 and “Best of Watercolor Places” in 1996. 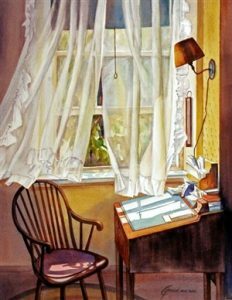 Additionally, they were judged at shows at the National Watercolor Society, the Shenandoah Valley Watercolor Society, the Southern Watercolor Society, the Maryland Federation of Art, Watercolor USA, the National Orchid Society Art Show, and the Delaware Watercolor Society, among many others. Her efforts earned her a wide variety of awards.